The first EP from this Italian trio is a four-pack of doom rock tracks, kicked off by the single with which the group started the year, "Angela". A quick horror movie sound-bite leads into the melodic mixture of drums, bass, guitar, and rich vocals, a formula followed for the rest of the EP once established. The songs go by quickly, as the group has a tendency to settle into a groove, give it a little flash, revisit the original, and go from there. It makes for some catchy tunes, just what you'd want from a starter EP of this type, and while Psychedelic Witchcraft have left themselves room to grow into more complex arrangements, the bluesy earthiness works well for them at this point. 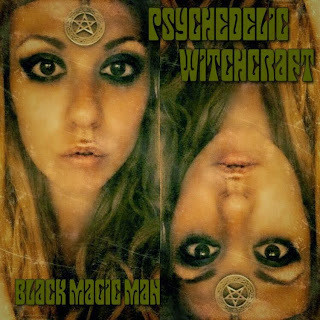 Black Magic Man is getting a limited release on 10" vinyl through Taxi Driver Records, so give it a listen if you're looking for something to play on your way to or from the pub before a night of Hammer Horror films.